The Upper Egypt court recently issued a death penalty to 529 supporters of the Muslim Brotherhood on charges of murder and inciting violence. Last year Egyptian lawmakers charged Obama and Hillary Clinton with conspiring with the Muslim Brotherhood in the commission of crimes and funneling cash to high-ranking Muslim Brotherhood officials. It’s currently unknown exactly where Obama and Clinton fit into this round of convictions and sentences. The Upper Egypt court has issued a death penalty to 529 supporters of the Muslim Brotherhood on charges of murder and inciting violence. Only 153 of those sentenced are currently in custody, the rest were tried in absentia. The sentence will have to be ratified by Egypt’s Grand Mufti before it can be carried out. “The court has decided to sentence to death 529 defendants and 16 were acquitted,” lawyer Ahmed al-Sharif told Reuters. 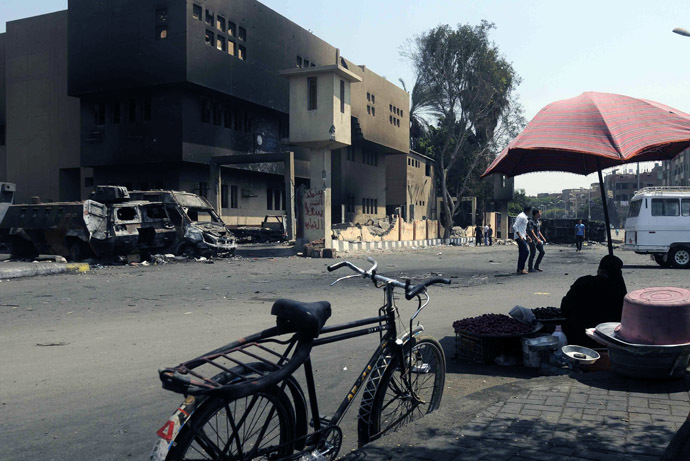 The Morsi supporters are charged with the murder of a deputy commander of the Matay district police station during the riots that followed the dispersal of the mass Rabaa sit-in last August. Other charges include violence, inciting murder, storming a police station, attacking persons and damaging public and private property. At least 632 people were killed during the dispersal, including eight police officers, according to government figures. The 529 people who have been issued the death sentence are part of a larger group of 1,200 Muslim Brotherhood members who are currently on trial. Another 700 defendants will be in court on Tuesday accused of attacking people and property in southern Egypt last August. “The court ruled that these people killed a police officer and attempted to kill two others,” Bel Trew told RT, adding that a sentence of this magnitude might provoke a wave of angry protests from Brotherhood supporters. Ahmed Nagib, a political activist, told RT that none of the defendants received proper legal representation and the verdict makes a mockery of justice in Egypt. “There is absolutely zero evidence and the lawyers for the defense were not even given a second to defend the accused. There is due legal process, and not just that but only 147 of those who were accused were present. The rest were tried in absentia. This whole process is shambolic, and a fiasco and another blow to the impartiality of the judiciary in Egypt. It put Egypt in an embarrassing position internationally and definitely it’s another blow to human rights and democracy,” he said.